Tabletop Microphone. 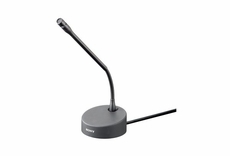 Ideal for conference or lecture application. Flexible gooseneck design, "AA" Battery and Phantom Power operation, matte black finish, noise-isolated base, inconspicuous wiring through the back of the base.